ASLA AWARD - News - James Carpenter Design Associates Inc.
James Carpenter Design Associates was recognized by The American Society of Landscape Architects for its work with Reed Hilderbrand on the transformation of the Duke University West Campus, in particular its positive impact on the site’s “Legacy and Community”. Specifically, JCDA, working with Architecture Operations transformed the West Union Bridge/Pavilion into a synthesis of the tree canopy in Crown Commons, embedding a sense of Duke’s forested grounds into the student’s circulation experience. The walkway merges the function of a bridge above and canopy below. Founded on the idea of walking through a forested landscape, this concept defines the main student-life circulation axis through the West Union District. The bridge is a thin and lightweight concrete structure featuring a coffered ceiling that both removes mass and adds structural efficiency. At the center of each coffer is a void occupied by a prismatic glass. From below, the coffers concave form is illuminated by the prismatic glass which is designed to also project points of light within the bridge deck’s cast shadow. The pub and lounge below the bridge are unique and memorable spaces enfolding students within a forest-like atmosphere, encouraging socializing and the exchange of ideas. The bridge’s pierced deck casts shadow and light while the reflective surface of the bridge’s underside directly images views of the adjacent tree’s understory creating a pleasant and dynamic environment that is an extension of the university’s landscape. 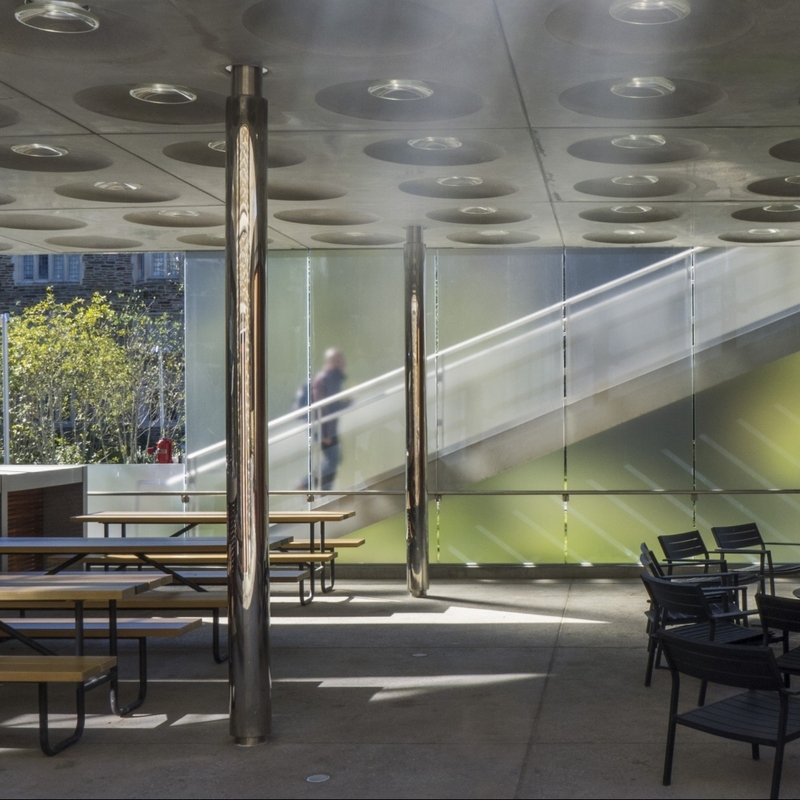 Strategic vertical planes of etched glass help define the sense of outdoor rooms below the bridge, moderating outdoor conditions and abstracting light and color from the adjacent landscape, capturing student circulation activity and revealing it within its materiality. Embodying the experience of Duke’s forest canopy, the Landscape Walkway marks and articulates the West Union campus, encouraging the exchange of ideas at the heart of student life.